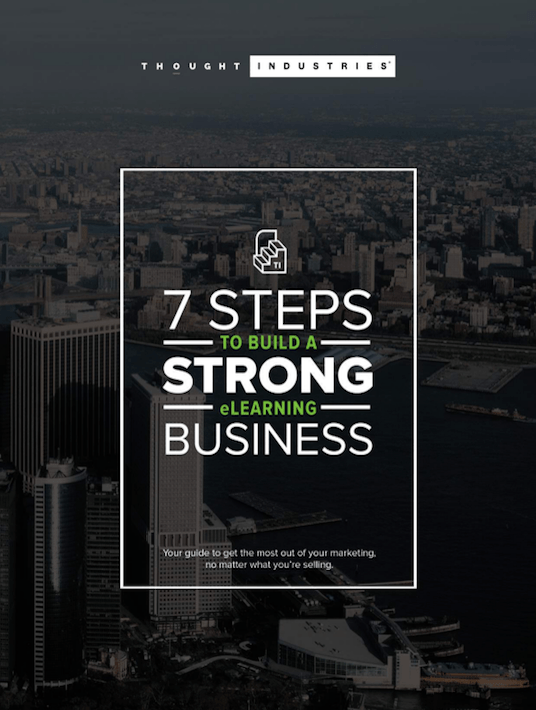 The eBook '7 Steps to Build a Strong eLearning Business' is a proven blueprint to get the most out of your marketing in order to grow your learning operation. Before you start thinking about product or marketing, be sure you think about your customer profile. Make sure your courses are differentiated in the marketplace, and build on your core expertise. Make sure you have an “owner” of the course content/experience in-house. To help determine your price point, how specialized is the course content? Determine the Key Performance Indicators (KPI’s) in your marketing funnel that you want to measure. At the “top of the funnel” you want to acquire the email addresses of current and potential customers. Management): This is the backbone of any effective marketing operation. It all starts with your customer. If your product is designed for the wrong audience, the problem you're solving for your customer is not clear, or the price doesn't represent value to the learner, you may have a challenge with garnering the type of profit you may be seeking. What is obvious throughout this eBook is that it’s customer-centered. If you take the steps described here, your efforts will encircle this conception. Understanding your customers will show the way for you to differentiate your product; then, you are at the point where you should control your costs and establish your price. The suggested path to follow is to be data driven, build your marketing funnel, and use free marketing tools, if possible. Mastering all this and funnel it into your online courses is one big step to success.